04:02 <NGC3982> Bah, i can't find documentation on how to add grf's properly to my server config. 04:12 <NGC3982> Yes, that works. Although, i have a new problem. 04:12 <NGC3982> I wish to play the game as a dedicated server, with other listening ports, server names and settings. 04:14 <NGC3982> So, how do i set a listening port in my savegame? 04:14 <NGC3982> I made it in windows, saved it and moved the file to the server. 04:15 <NGC3982> For god sake. 04:15 * NGC3982 removes and tries to write a new config. 04:17 <NGC3982> I only moved the savegame file to the server. The original openttd.cfg does not change when i start or stop the savegame file. 04:17 <NGC3982> What cfg are you refering to? 04:20 <NGC3982> That worked. Though, what do i do when i wish to start simultanious servers with the same base config? 04:20 <NGC3982> I guess i can change the config again, as long as the first game is still running? 05:13 <NGC3982> I see. I guess im better off creating individual config files instead. 05:13 <NGC3982> Yes, i did. 05:31 <peter1139> So __ln___ has an extra _, and I have an addition. What is the world coming to? 05:34 <Sacro> peter1139: peak entropy? 06:17 <NGC3982> So yeah, using individual configs > everything else. 06:27 <NGC3982> Well, writing a config is not that much work. I copy the last used one, and change some parameters. The only part of it that's actually work might be the NewGRF's. 06:31 <NGC3982> But, if i use a savegame, i also have to use the default cfg file on the server, as i discussed with PM above? 06:31 <NGC3982> And that seems to be a problem when using multiple instances of openttd running dedicated. 06:32 <NGC3982> I use a different listening port for each server game, for instance. 06:34 <NGC3982> You mean; I can use the -c and -g together? 06:34 <NGC3982> That changes everything. 06:42 <TinoDidriksen> Pretty sure you can configure that. 08:44 <NewTT-Fan> Whenever I start a game, the industry includes their locations faster than I have earned enough money to service these sites! how can I prevent it? 13:51 <frosch123> you do not turn off your computer over night? 14:01 <andythenorth> are bananas downloads more or less than usual? 15:05 <Colombo> Hi all, I have small question. 15:05 <Colombo> As a lot of grfs have setting, it is possible to change these settings on server? And if so, how? 15:06 <Colombo> As I am not running the server, just... friend have started it for me and gave me the password and rights to manage it. 15:07 <Colombo> I don't have direct acces to server, just as client in game with password. 15:07 <Supercheese> Colombo: can you load savegames on the server? 15:09 <Colombo> And in standard setting, is there anything that would make terraforming more expensive/harder/impossible? 15:18 <Colombo> Can I somehow edit files from openTTD console? 15:19 <Colombo> This could solve a lot problems. 15:19 <Wolf01> could I write my essay with the signs and then export it? 15:21 <Colombo> planetmaker: I don't care if it wouldn't work in current game, I could restart it. 15:22 <Colombo> planetmaker: How this could help? 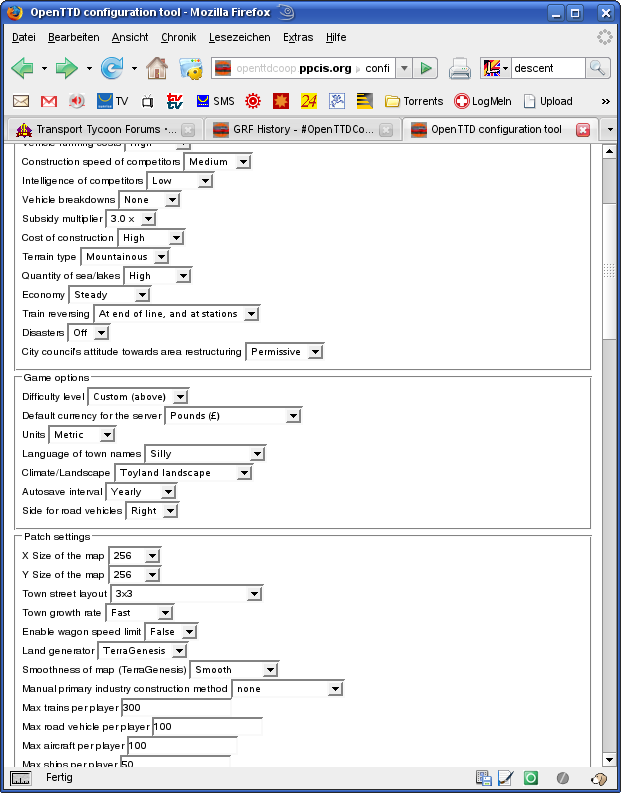 15:22 <@planetmaker> you'll either need ssh - to edit openttd.cfg. Or you need means to upload a savegame. 15:24 <andythenorth> can I have a text-based, in-game tile editor? 15:26 <@planetmaker> rcon upload ? 15:42 <Eddi|zuHause> just keep the seed empty by default? 15:42 <@planetmaker> and when not? And how long keep it then? 15:46 <frosch123> Eddi|zuHause: and who would actually want to do that? 15:46 <frosch123> why should it be saved in the first place? 15:46 <Eddi|zuHause> frosch123: who would care about whether the seed is kept throughout restarting the game? 15:51 <frosch123> Eddi|zuHause: i believe you can also pass a seed to "newgame"
15:54 <Eddi|zuHause> openttd is dying!! 15:55 * andythenorth isn't trolling, maybe ottd is actually finished? 15:56 <@planetmaker> oh, that was still on brianetta's server! 16:10 <@planetmaker> Blog article from 5 April 2007: Passenger Destinations – we need them!! 16:28 <Eddi|zuHause> wouldn't bus stops perform that better? 16:51 <Eddi|zuHause> hm, how was that solved? "src/fileio.cpp:629:36: error: invalid conversion from ‘const char*’ to ‘char*’ [-fpermissive]"
17:03 <lucky_> is it possible to pull up a chat backlog? 17:07 <@Alberth> did it also state the solution? 17:10 <Eddi|zuHause> well, there's a solution somewhere in trunk, but how to find the right commit? 17:14 <frosch123> -Fix: GCC 4.5@HEAD not compiling OpenTTD anymore because of a "non-placement deallocation function [is] selected for placement delete"
17:27 <frosch123> svn 1.7 ? 17:45 <Eddi|zuHause> yeah, i replaced some "protected" inheritance to "public"
18:03 <Eddi|zuHause> where have they gone? 18:05 <+glx> in some .ini maybe ?